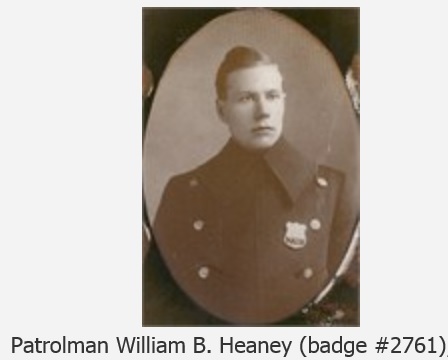 Patrolman William Heaney was shot and killed after responding to the sounds of shots being fired in front of 235 Mulberry Street in Manhattan. When Patrolman Heaney arrived, he found a suspect had just murdered another man. The suspect shot and killed Patrolman Heaney as he approached to make the arrest. When Patrolman Teare arrived, he observed a man with a smoking revolver, and when he attempted to disarm the suspect, the suspect fired two shots wounding Patrolman Teare. Patrolman Teare was removed to St. Vincent's Hospital where he died the next day from his wounds. The suspect was apprehended several days later. He was convicted of murder and sentenced to death. On June 21, 1916, only eight days before his execution date, a gun was smuggled into the prison and given to the subject. In the early morning of June 22, 1916, the suspect called Guard Daniel McCarthy, of the New York State Department of Correctional Services, to his cell and asked for a slop bucket. When Guard McCarthy opened the cell door, the suspect shot and killed the guard, grabbed his keys, and escaped from the prison. The subject was arrested a short time later and returned to Sing Sing Prison. He was kept sedated until being executed in the electric chair on June 30, 1916. Patrolman Heaney was assigned to the 12th Precinct, the present day 5th Precinct. He was survived by his wife.